Lynda Sellers’ new children’s book “How To Get Whacked By a Cat” (published by Trafford Publishing) – which she both wrote and illustrated – is a light and humorous read that pokes fun at the way problems are handled and, as the author says, provides the truth that God will help you handles the “whacks” in life. For the puppies in this story, trials come in the form of whacks from a cat. For real people, whacks or trials may come in the form of illness, job loss, divorce, and other troubles or afflictions. The proper and Godly manner to respond to such challenges is the focus of Sellers’ writing. 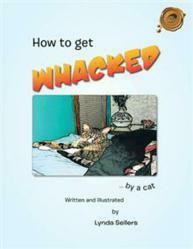 Sellers was inspired to write “How To Get Whacked By a Cat” by her husband, who suffers from Parkinson’s disease. “In January 2007,” she says, “his doctors located a brain tumor, which was removed in February. He handled these ‘whacks’ in his life through God’s guidance and grace. Although he continues to struggle with the chronic illness of Parkinson’s, he exemplifies the fact that you can handle anything if you allow God to guide you through it.